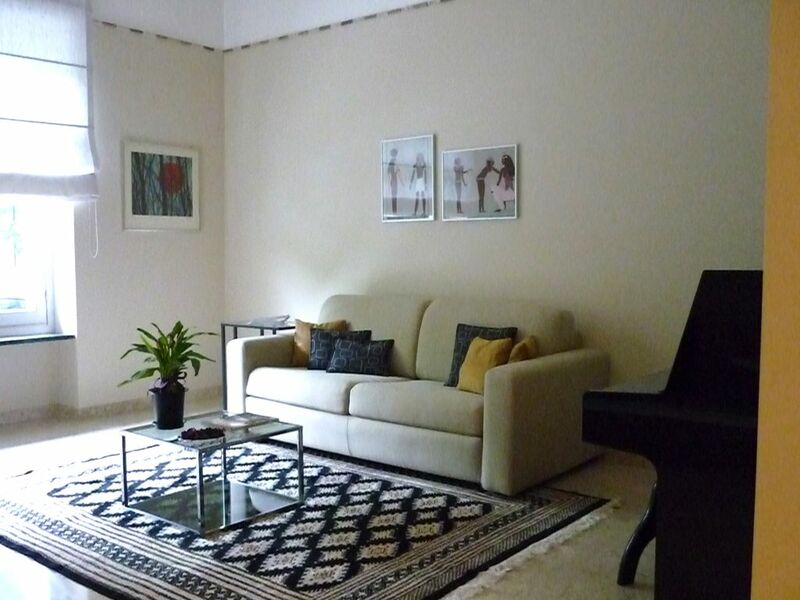 In an elegant central area, Crocetta, well connected to any area of ​​the city, facing green area, in a condominium condominium with a concierge, large and bright two-room apartment of 68 sqm of high standard, new refurbishment, welcoming atmosphere. The apartment consists of living / sleeping area with sofa bed, kitchen with appliances, double bedroom, anti bath with washbasin, washing machine and bathroom with W. C, bidet, large shower, hallway, balcony. In the presence of toddler we can integrate with cot and high chair. Upon request you can turn your double bed into two single beds. All the apartment / facility is available to guests including the listed facilities, while they can access the condo yard to deposit the separate collection bags in the appropriate containers. If guests want it, we are available to provide city information and any solutions to specific needs. On request we could be available throughout our stay. In the apartment are available, in consultation, volumes and magazines on historical-artistic and food and wine of the city of Turin as well as information documentation on the tourist routes and the historical-artistic attractions of the city of Turin and Piedmont. On other specific details about which guests will want to be educated, I am available to inform them, as far as I know, before and during the trip. Check-in time: 17:00 - 19:00. Festivals or rallies can not be organized, however, always avoiding harassing noise in general and in particular from 20.00 to 8.00 am. Guests can not stay in the apartment unless stated in the booking and whose data has been sent to the "Hosted Web Portal". Do not use more than two electrically powered appliances (washing machine, dishwasher, oven, microwave, induction hob, toaster, hair dryer, underfloor heating, air conditioner) at the same time to avoid overloading the electrical system. Run separate collection as indicated and bring the waste bags into the specific containers in the condo yard. When leaving or leaving the apartment turn off all the lights and lower the blinds in particular the two electrified ones and, at the end of the stay, all the books, magazines and catalogs at your disposal for the period, store them in the library or shelves. .......... and finally thank you for leaving the apartment as you pleased to find it! Parking unavailable in the accommodation - Front side parking on the street or in garage for a fee (about € 10,00 / day or € 28,00 / week), 8/10 minutes walk free parking. The 6 kg washing machine is located in the antibag. with charge from above. The shower (not visible from the photos) is large in size: 70 x 100. Per prenotazioni settimanali è richiesto un deposito cauzionale per eventuali danni alla proprietà pari al 20% dell'importo tariffario calcolato, da versare alla prenotazione e che verrà restituito entro il 14° giorno dalla partenza se non verranno rilevati danni. Per periodi superiori alle due settimane ed entro i trenta giorni è richiesto un deposito cauzionale per eventuali danni alla proprietà pari al 10% dell'importo tariffario calcolato, da versare alla prenotazione e che verrà restituito entro il 14° giorno dalla partenza se non verranno rilevati danni. Per periodi superiori ai trenta giorni, a fronte di contratto di locazione, viene stabilita una cauzione pari all'importo di una mensilità che verrà restituita entro il 14° giorno dalla partenza, se non verranno rilevati danni. All'atto della prenotazione leggere con attenzione le regole della casa che si chiede di sottoscrivere e seguire scrupolosamente. Tassa di soggiorno di € 2,30 a persona calcolata per i primi sette giorni di permanenza solo per periodi inferiori ai trenta giorni oltre i quali occorre stipulare un contratto di locazione non sottoposto alla tassa di soggiorno..